Two Co Antrim men who beat another man with a brick following a car chase in Carrick were told on Monday that they will be sentenced for the attack later this month. Kenneth Graffin and Samuel David McMaw both admitted attacking the other man occasioning him actual bodily harm in September 2016, while Graffin pleaded guilty to an additional offence of dangerous driving. Belfast Crown Court heard the violent incident occurred at a time when they was “ill feeling” between those involved. The court also heard that despite being attacked with a brick, the injuries caused to the attacked man were relatively minor. Outlining the Crown case against Graffin (34) from Oakwood Road in Carrick, and co-accused 29-year old co-accused McMaw, from Starbog Road in Larne, prosecuting barrister Sam Magee said the incident occurred on the evening of Tuesday September 6, 2016. At around 10.20pm, the injured party was in the Joymount area of Carrick with two friends when he saw a man he knew who acknowledged him. This same man then drive past the three friends and was verbally abusive. As the injured party then made his way along the Larne Road, he noticed a black Vauxhall being driven along Victoria Road. Graffin was behind the wheel while McMaw was one of two male passengers on board, and Graffin stopped and parked the vehicle in the car park of a shopping complex. Mr Magee said Graffin then drove at speed towards the injured party, who at this stage got on his mountain bike and began cycling towards the police station, while his two friends fled. During the chase, Graffin drove along the Larne Road in pursuit of the injured party, who managed to avoid being struck by the car as he cycled. The injured party then got off the bike, but was then struck by the car driven by Gaffin. 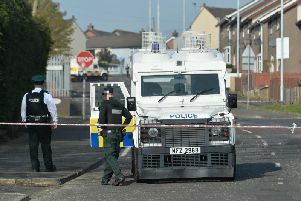 This action, Mr Magee said, resulted in the injured party being “knocked off his feet”. At this point, he was able to get to his feet and jump over a fence, but he was caught by McMaw. The court heard that while a man not before the court assaulted the injured party, Graffin “suggested using a brick to strike him ... they did, and he was struck repeatedly.” McMaw then took the man’s keys before leaving. Graffin was arrested several hours later, and initially denied both knowing the injured party and being involved in an attack on him. When he was interviewed again in November 2016, Graffin admitted the car used to chase the injured party was his mother’s, and that a mobile phone dropped at the scene of the attack was his - but claimed he lost it. McMaw was arrested for the first time in November 2016 and gave a largely ‘no comment’ response, but denied involvement. The pair subsequently admitted assaulting the other man, while Graffin admitted driving dangerously. Regarding the offence itself, Mr Bacon said “thankfully” the injured man wasn’t as badly wounded as the gravity of the incident could have dictated. Branding the incident as “very unsavoury”, Mr Boyd said McMaw “deeply regrets” any fear and injuries caused to the victim. Pointing out the incident was two years ago, Mr Boyd added McMaw now “spends all his time doing his best for his partner and family”. Judge Patricia Smyth said that she wanted time to reflect on the case, and said she would sentence Graffin and McMaw in a fortnight. She also granted the pair continuing bail, but warned that this should not be taken as an indication of the sentence she will pass on September 17.